I maintain a large nightclub that has 12 D18-I subs in their main room (1000 capacity floor + 200 balcony). These subs can go down very low, and despite the frequent claims that doing so will eat all available power, they can do so at decent levels. Sloppy output is tamed by using proper limiter settings on the ELF processor, but in the end, this is just not that great of a sub. Plenty of distortion and in-precise output. But they do go low and can send vibrations through large amounts of concrete. I would never buy anything from Bag End personally, but I'm willing to use them. And when you need solid response down to 20Hz, there are not many other options out there. The dual 12" BagEnd with the XLR-equipped ELF Integrator is designed for use down to the mid twenties. (The 8Hz device is RCAs and home theaters.) The nice thing about the dual 12" is that just about anybody you send out with it will be able to lift it. A single channel of a Crest CA9 was able to drive a pair of the BagEnd dual 12s in a 500 capacity room and have it sound big enough for the primary renter to threaten to pull the plug, while coming nowhere close to taxing the amp. In this room each BagEnd sub's pole socket held a fixed-length pole with a BagEnd 2000 (a two-way 12" and a horn) on top. Everything was time-aligned by design. The 2000's passive crossover is part of the sound, and I could hear no indication that bi-amping the tops would be a big advantage (or indeed any advantage at all). You can cheat the ELF Integrator on the top end; but I'd route the bass frequencies through the ELF. For a one person crew, a BagEnd system can have some weight advantages. A well-powered BagEnd 12 over 12's rig can kick. I haven't posted here for a while, but from my personal research and experience, If you need True High output bass in the sub 40Hz range, and especially in the 20Hz Range. As far as I know the Difference between the ELF and Infra, is that Ron Wickersham from Alembic had a falling out with the Guys at Bag End, and is no longer allowing them to use his ELF circuit, I doubt there is very much difference in the Infra Controller. A Bag End ELF or INFRA doesn't have any advantage because at the end of the day. 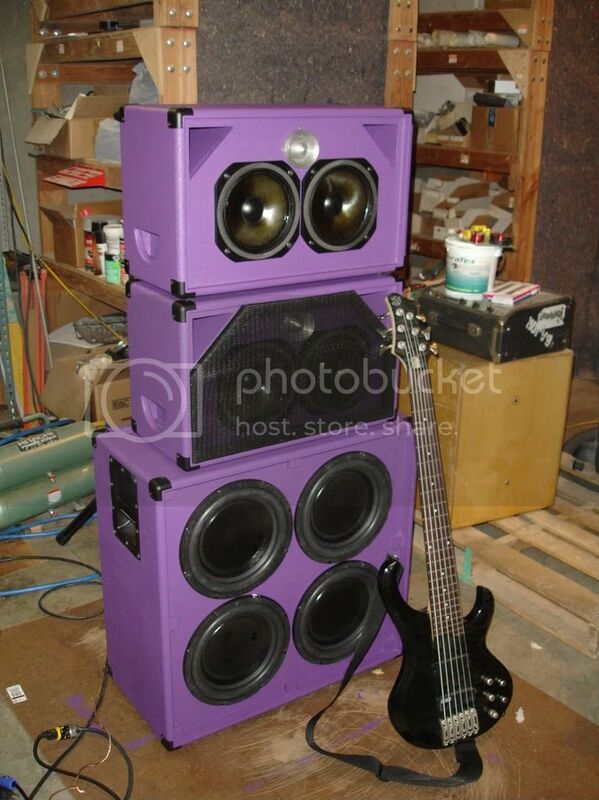 You are going to need to have about the same cu' in cabinet if you used a ported cabinet, And more than Twice the Amplifier. And compared to a tapped horn you'll probably need double the cu' of cabinet and more than twice the power. What they do to get the Bass Response out of ELF / Infra Subs is they use the Predictable 12dB per octave Roll off of a sealed Sub woofer. And use a simple Electronic circuit Called an Integrator (which has a constant 6dB per octave slope that starts rolling off bellow DC) They put two of them in Series which gives a 12dB per octave slope (hence Dual Integrator). They line these slopes up with the cabinets roll off knee to yield a flat response that rolls off above the knee (Unless, they sum with a high pass filter). I think the final stage is a compressor limiter that probably has a side chain that prevents the amp from ever over-driving the amplifier with respect to the EQslope. I'm not sure what the current rated sensitivity of the ELF/Infra system is above the knee, but with this approach Maximum output bellow the knee is heavily limited. If the knee is at 50Hz and the output there is 95dB @ 1 Watt, then it will take 20Watts for the cabinet to produce 95dB @ 25Hz, and 400Watts to produce 95dB @ 12.5Hz (Which I doubt is going to happen). Maybe some of the more experienced Members here Can comment but I remember reading some in some statement that using the Dual integrator circuit somehow bends the phase back in the right direction. I haven't compared the phase characteristics of a Low pass filter, or Linkwitz-Transform Circuit VS a "Dual Integrator", but I don't see how its a better phase shift. Another Thought about the ELF/Infra, I've only seen a couple but, it doesn't look like the cones and surrounds they are using are actually appropriate for the application. Basic Pulp Cone with Accordion style surrounds, Just by looking at them I'm imagining a lot of mechanical noise and distortion from the cone. I'm sure that 8Hz through one of those at its maximum power is going to have a lot of distortion, and that the 8Hz tone will never cross the threshold of audibility, even if they are using a very exotic spider and surround that is totally silent 8hz is not going to be able to cross the threshold of audibility without a huge amount of Cabinets, and if it did you and your audience might not like it very much. Wut I have newbie Status, Wut happened to my "Has No Life" Status. Damn I guess things change when your away for a while. Which is why in the home theater world at least one company (Triad) had marketing for a few years stating their subs as "better than Bag End". The powersub line is similar in concept to the BE infra products, with sealed enclosures with compensation circuitry to, but the drivers they selected were more appropriate for the task. IMO the Triad platinum powersub line from them is still to this day one of the most musical subwoofers I have ever heard. Don't ever say the phrase "musical subwoofer" on a pro audio board, then men in the butterfly nets will take you away . I don't know what the Triads sound like, all of the audiophile shops in my neck of the woods have shut down, but talking to those guys was frustrating. Is this audiophile. I build this sealed sub with 4 lab 12's and 2 1KW B&O ICE amps. I used the DSP engine to sum some filters to approximate a linkwitz-transform. Very clean, no mechanical noise that I can hear. Its fun to close my interior door and run a sweep from 30 to 5 Hz and watch the my door violently chatter. It only weighs 175 lbs really fun to move. a six shooter bass geetar !!! Its good for lazy players like me who hate switching hand positions. I carried a Bag End system for years comprised of TA-15s and 18" subs without ELF. One venue we worked was using the Infra system or ELF, or whatever you wish to call it, and we never saw much difference between the two systems. Both had a similar sound quality and the extended low end of the ELF must have extended outside the room because we never heard it. What I did like about the Bag End system was the overall sound and low wattage requirements. The sound was very smooth, but unfortuneately 125db was pushing pretty hard on those cabinets. The ELF or INFRA systems ? Well, I can take or leave them and much like Bose they have their place. The now infamous 551P-TAC, 2242H loaded subs are all that remain of these boxes. As long as you have large hands. Except the reality is that you can't hear it. My old Servodrive Contrabasses eat those things for breakfast. You want to go low, the Danley Sound Labs line is the way to go. You're saying you can't hear sounds in the mid 20s? I'm sorry to hear that. I mentioned the 8 cps parenthetically (that means as an aside in relation to my main posting) since there seemed to be some confusion on this topic. The 8 cps stuff is designed for rich owners of home theater systems, not live (i.e. pro) sound operators. I would have thought the mention of the RCA connectors (in the parenthetical comment) as opposed to XLRs would have made that clear, but obviously not. So to summarize: Bag End pro subs with the ELF controller do not claim to reach 8 Cycles Per Second. Never have and (hopefully) never will. I'd even go so far as to suggest that any pro gear that does operate at 8 CPS is probably being used for torture (oops, make that 'enhanced interrogation') or brainwave entrainment of some sort. Finally, the Servodrive Contrabass at 120 pounds is more than most people old enough to still say 'CPS' can safely lift. The Bag End dual 12 I mentioned in the posting weighs 74 pounds. Let me clarify-they will outperform any of the Bag End ELF products. Period. I can and have heard reproduced signals down to 3hz. I've mixed on a Bag End system that used the dual 12 sub/elf processor until I did them a favor and replaced it with a dual 15" custom vented design using Eminence drivers that trumped that box using the same amp, and no processor. I've been at a club that uses the D18 for synth player who used a Contrabass as part of his stage rig-guess where the earth shattering low end was coming from? (hint-not from under the stage where the D18's were). The Contrabass was(and probably still is) one of the best reproducers of elf made-and especially for it's size(under 8 cubic feet). The Bag End hype of 8hz reproduction was marketing-it wasn't audible. -2db at 8hz, 95db sens. at 80hz, at 20hz, it's 75db, at 8hz, about 56hz. The integrator can only overcome a little of this design's issues-the lack of linear excursion of the drivers being prime. BTW, I use a handtruck, and the difference between moving a D12 or Contrabass is almost non existant. Btw, has anyone changed elements on these? Other than original Bag Ends. I have a pair of S18E's needing new drivers. More SPL is also welcome, if possible!